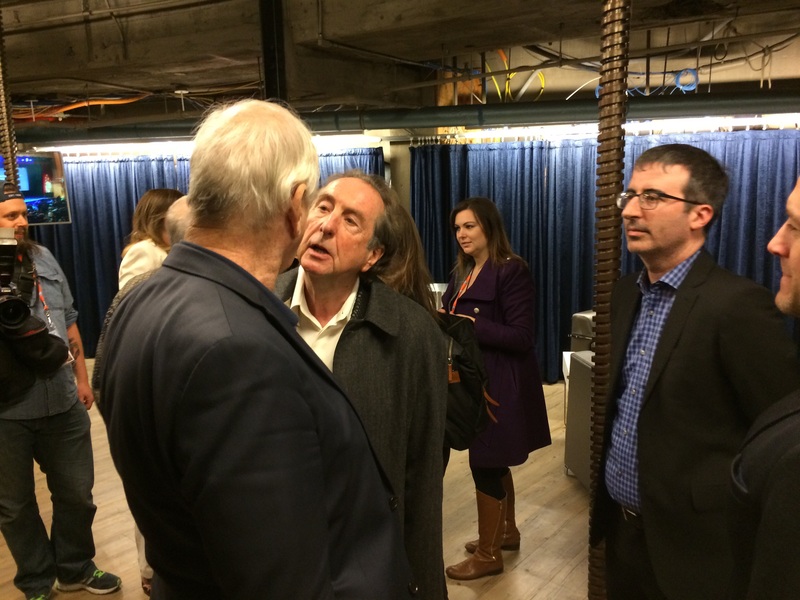 The green room at the Beacon (actually, under the Beacon) Theatre was well-stocked with food and drink after the Q & A, as the Pythons and friends made their way downstairs (thanks to Jeff Slate for the photo!). One of the nicest things about a Monty Python party (and, to paraphrase from Life of Brian, I should know, I’ve been to a few) is how so many familiar faces and members of the Python family seem to turn up. It’s always particularly happy to see the various family members, former co-workers and devoted friends that only seem to turn up every few years at these kinds of events. 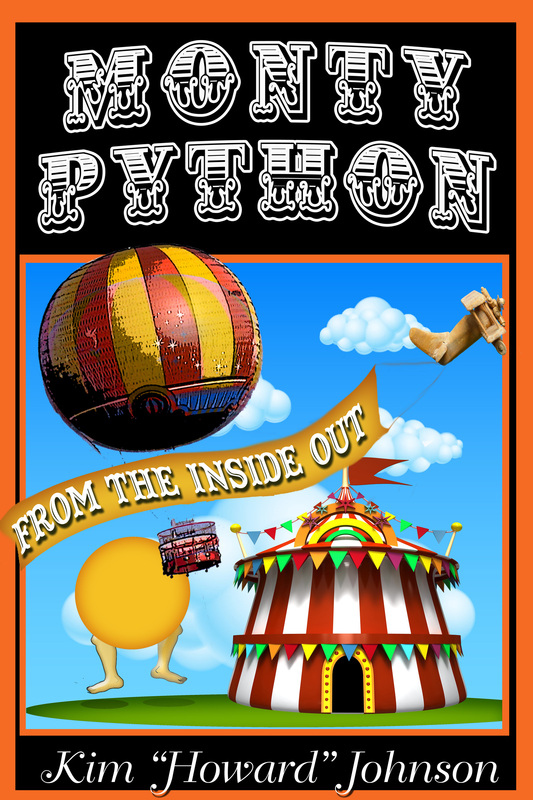 Strange as it may sound, Python is a family (and of course, the fans are a valued part of that family. But it was delightful to see folks like Roger Graef, Simon Jones and his wife Nancy, and John and Linda Goldstone. I followed Terry Jones and John Oliver into the room and we all had a drink as the rest of them poured in, and everyone had a chance to catch up properly. I was approached by several people whom I had forgotten, and had to be reminded that I knew because they were “friends of Graham.” I took them at their word because, well, Graham certainly had a lot of friends. 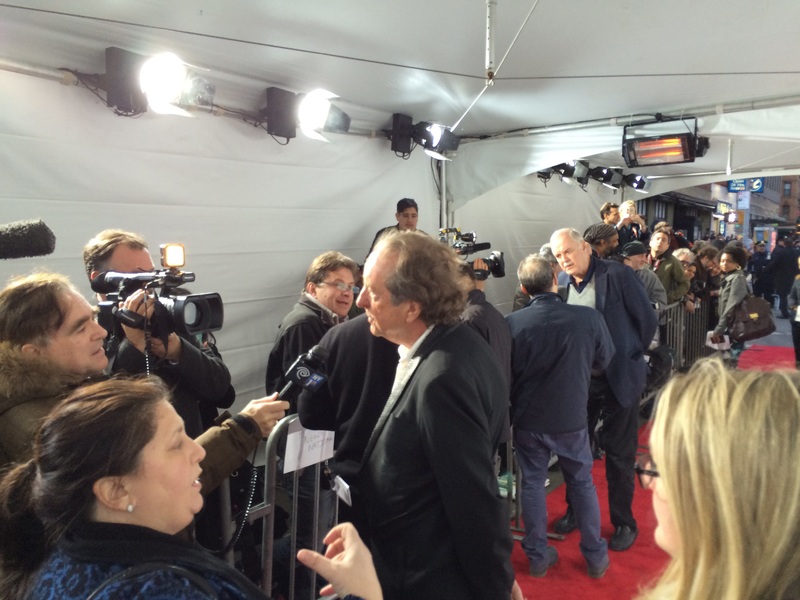 A few famous faces made their way in, and I saw John talking to Hank Azaria. It soon became rather crowded, and Terry J suggested that we head down the block to the Amsterdam Ale House for dinner, where I mentioned earlier that they were serving Stone Dry Hopped IPA on cask. Terry hadn’t forgotten. I made my way over to John to let him know I was leaving, and I saw him talking to John Goldstone. As I approached him, however, I realized it was not John Goldstone, but in fact Kevin Kline and his son. I apologized for my intrusion, but Kevin was glad to see me, as we had spoken on the phone several times when I worked for John, but we had never met. We also joked about how John used to make fun of his acting, noting that while he felt Kevin was a great actor, he was an even greater over-actor. And so with that, Terry J and I and a couple of other friends headed up to the Ale House for dinner and drinks. Despite the jet lag and general lack of sleep (I had gotten up at 3 a.m. for my flight), we found some extra adrenalin that kept us going well past midnight for a successful day, and a memorable Python anniversary. This entry was posted in Monty Python, tribecafilmfest and tagged #ericidle, #johncleese, #montypython on May 1, 2015 by howardjohnson1985. This entry was posted in Monty Python, tribecafilmfest and tagged #ericidle, #johncleese, #montypython on April 29, 2015 by howardjohnson1985. A bit of TriBeCa fun. This entry was posted in Monty Python, tribecafilmfest and tagged #johncleese, #montypython on April 29, 2015 by howardjohnson1985. 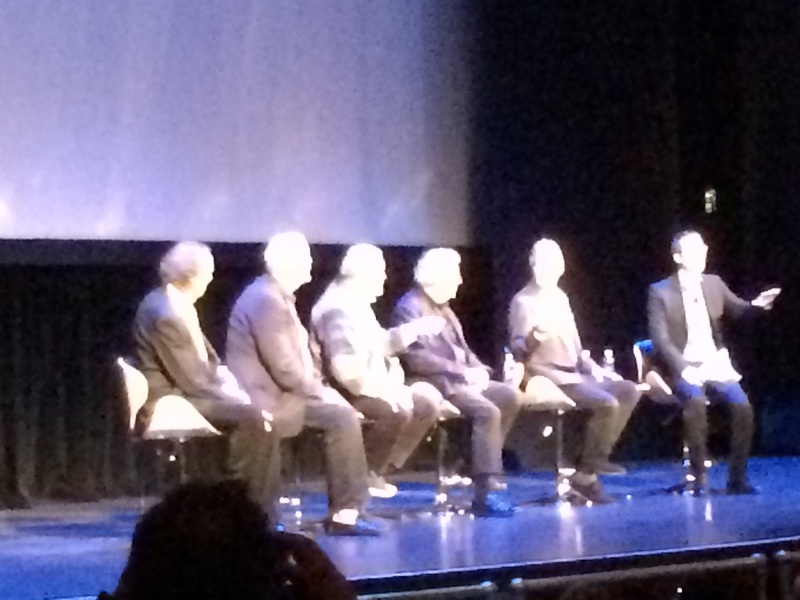 We heard their introduction and Jeff, Holly, a few Tribeca Film Festival folks and I stepped into the auditorium. The crowd roared as they slipped into their row of chairs and John Oliver began the conversation. 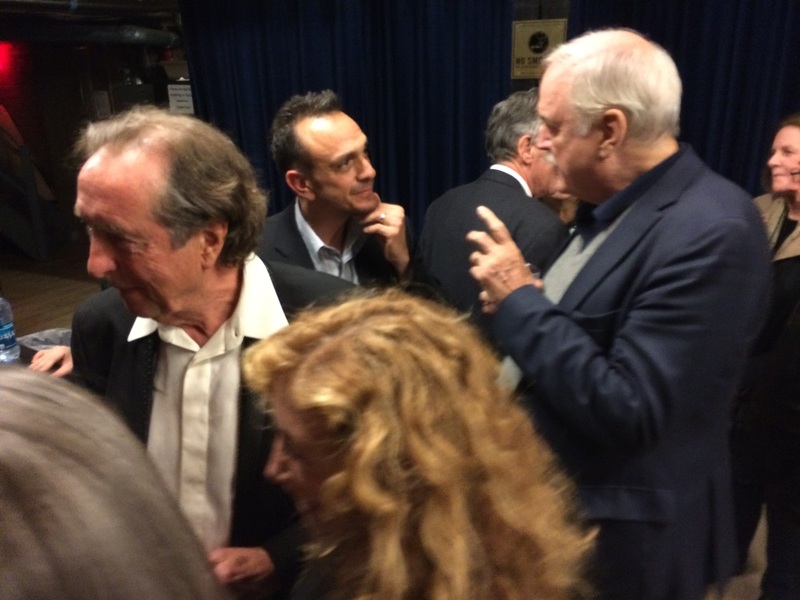 It wasn’t long before the boys became restless however, and John Cleese walked offstage for a few moments. He returned with another chair, and pandemonium–very hilarious pandemonium–slowly began. Among the highlights: each of them re-arranging chairs so that half of them were facing the back of the stage; all of them but Eric dragging their chairs over next to John Oliver, encircling him; and John Cleese disappearing again and eventually waving his hand through the backdrop, causing enormous laughter completely out of context so that John Oliver was visibly baffled at the audience’s reaction (until he saw John’s waving hand). 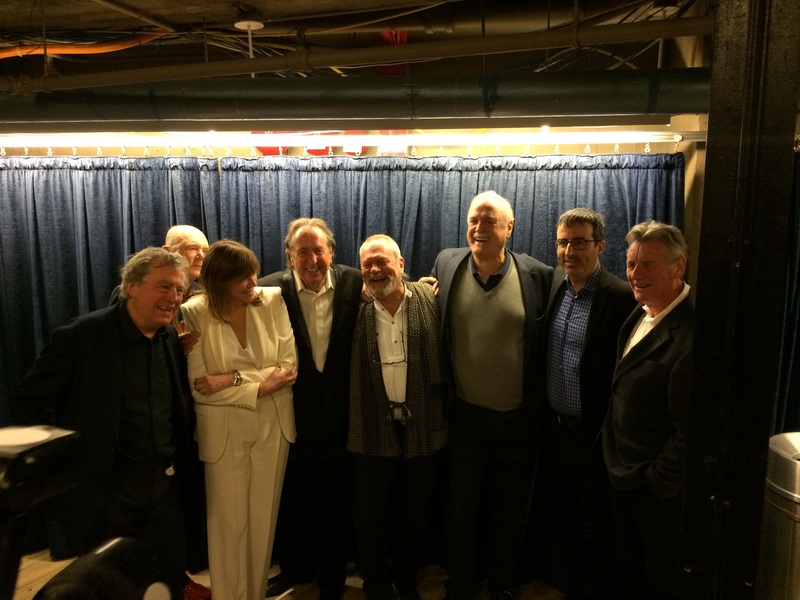 After it drew to a close, we all convened backstage. “I think you needed a whip and a chair out there,” I told John Oliver who laughed, but I assured him he did a great job controlling the uncontrollable. We all proceeded to the green room, where the guests would soon be arriving. I quickly learned the reason for the Marx Brothers routine: “We couldn’t hear a thing!” John explained. He decided to go backstage because (a) it was a bit of physical comedy, and (b) because he felt that if they couldn’t hear, the whole discussion would be a disaster. Later on that night, the two Terries confirmed it (and they were sitting closer to John Oliver than John was). Nevertheless, everyone was in a jolly mood and the party began. 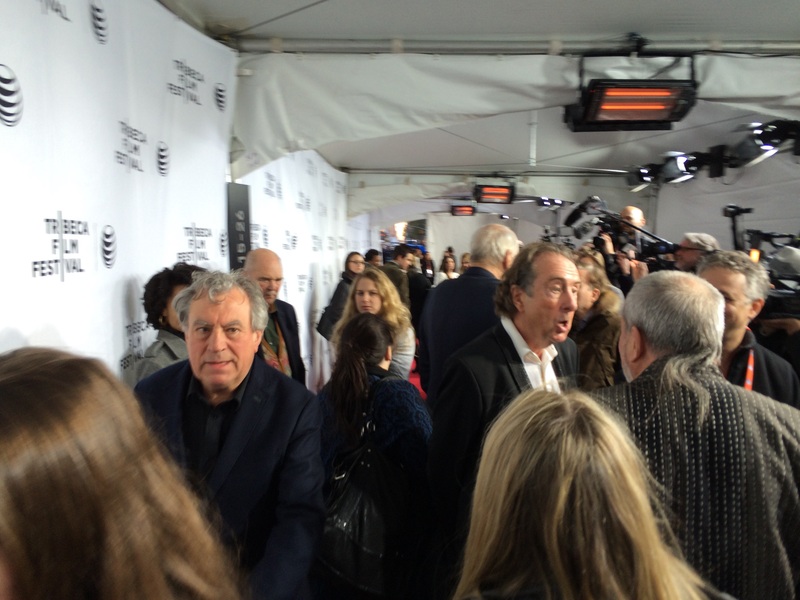 This entry was posted in Improv, Monty Python, tribecafilmfest and tagged #ericidle, #johncleese, #michaelpalin, #montypython, #terrygilliam, #terryjones, tribecafilmfest on April 27, 2015 by howardjohnson1985. 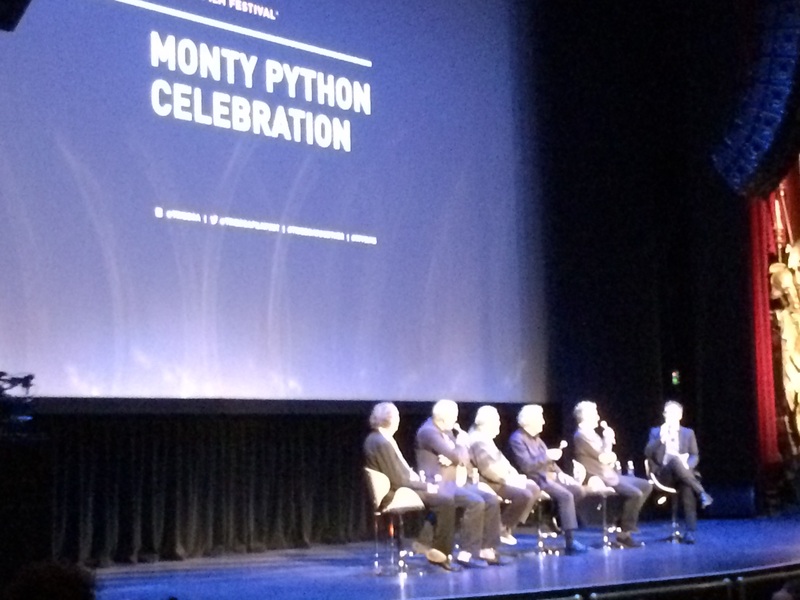 Sitting at LaGuardia, waiting for my flight, seems like a nice opportunity to reflect on the Monty Python weekend at the TriBeCa Film Festival. 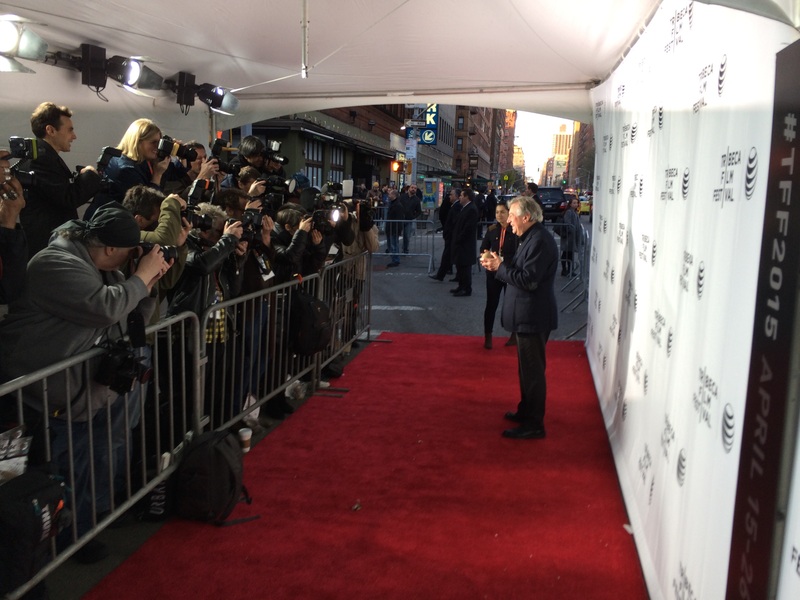 Friday night was the 40th anniversary of Holy Grail, and the TriBeCa folks certainly did it right. The huge Beacon Theatre was packed–in fact, an entire city block was annexed by the group, with a large red carpet area set up for the Pythons to meet the press. The guys spilled out of the bus and into the tent, accompanied by Mrs. Idle and Mrs. Palin, Ms. Gilliam, as well as my pal Jeff and I. The boys began posing for the cameras as only they can. The cameras continued to roll while the group members were interviewed by scores of reporters, most of whom managed to ask “Did you ever think Holy Grail would still be popular 40 years later?” (BTW, the answer is “No.”) After this was under way, I was enlisted to pass out coconut shells to the reporters who wanted them (which turned out to be all of them). It was amazing to be walking along the red carpet, dodging Pythons, while being besieged by grown men and women desperate for hollowed out coconuts. 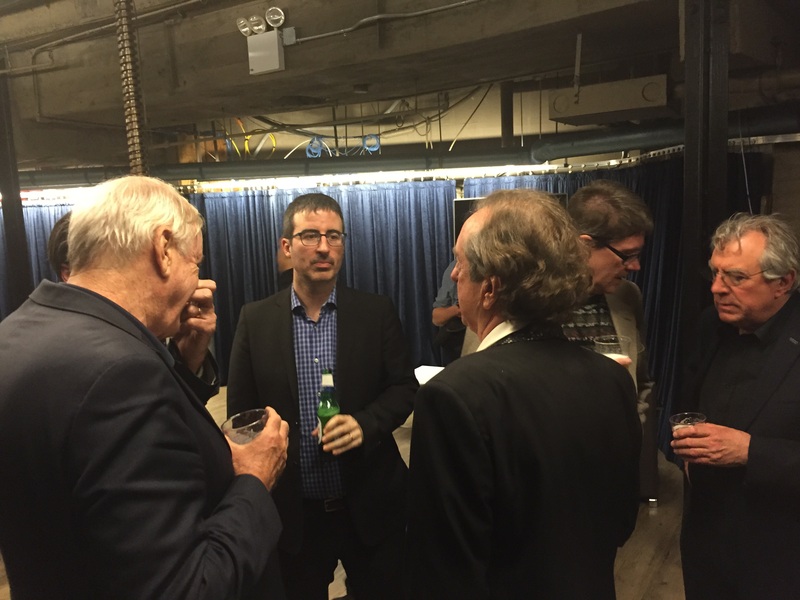 Then it was into the bowels of the Beacon and the green room, where John Oliver awaited. He approached everyone and introduced himself (even us non-Pythons). A class act, in addition to being a wonderful host. As the lights went off in the sold out Beacon Theatre, the Pythons slipped in to watch the movie, some for the first time in many years. I sat next to Terry Gilliam and Michael Palin, and was treated to their running conversation about the filming and the people involved. I am very lucky. This entry was posted in Monty Python, tribecafilmfest and tagged #johncleese, #montypython, Eric Idle, john oliver on April 26, 2015 by howardjohnson1985. 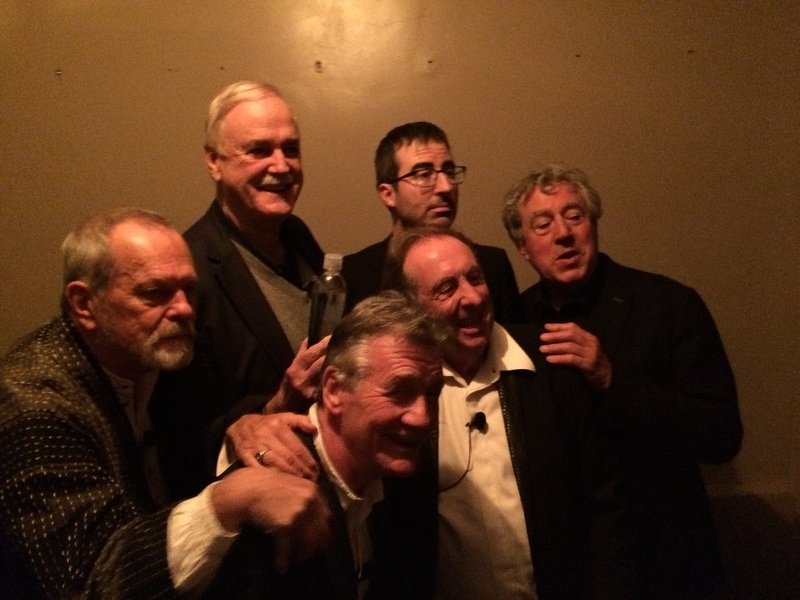 This Friday night is the night a lot of American @montypython fans have been waiting for, as 5/6ths of the group re-unites for a 40th anniversary screening of Monty Python and the Holy Grail. It’s being presented in association with the Tribeca Film Festival, which is presenting a full slate of Python films this weekend. I’ll be posting, tweeting Facebooking, Tumbling, etc. over the course of the weekend, so be sure to check back for updates. And if you’re thinking of attending, you can find more info here. 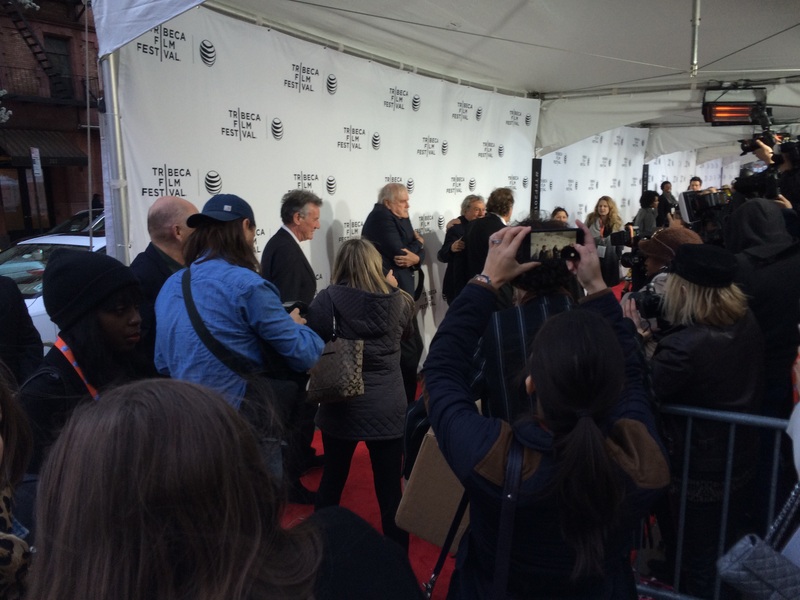 This entry was posted in Monty Python, tribecafilmfest and tagged Monty Python on April 23, 2015 by howardjohnson1985. 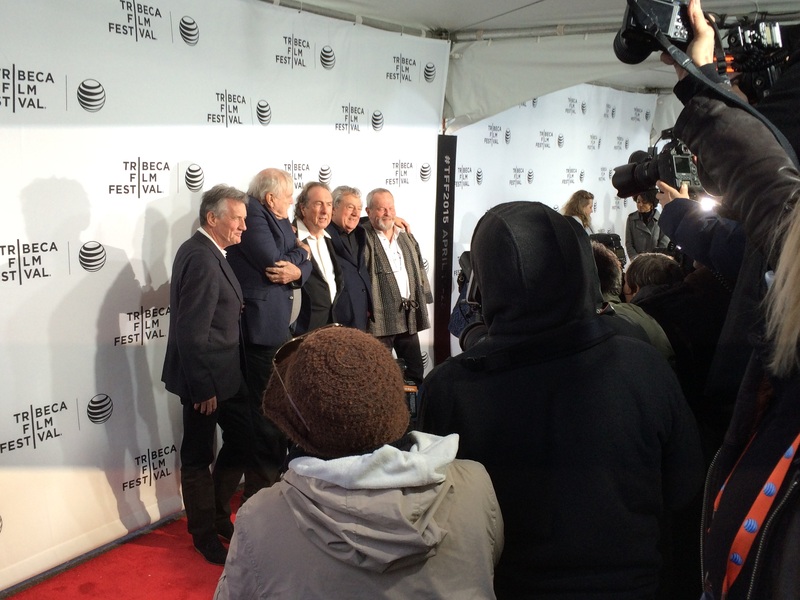 In case you haven’t heard, the five Pythons are appearing together at the Tribeca Film Festival in April in New York. There will be screenings of their films, and the US premiere of a nifty new documentary that chronicles the 2014 reunion shows at the O2 in London. Tickets for the various screenings go on sale March 23 at tribecafilm.com. If you’re in New York, or even close to New York, you’ll want to be there. Here’s more info. This entry was posted in Monty Python, tribecafilmfest and tagged #montypythonlive on March 15, 2015 by howardjohnson1985.